lululemon, DSW, b8ta, and Zebra technologies presented on a panel at MIT about the intelligent integrated storetheir visions and current progress towards integrating the various functions, sensors, and systems in a retail store. The goal is to achieve a higher order of intelligence and detailed, granular, near real-time visibility into what is happening with each shopper, each associate, and each item in each store. Earlier this month, I had the honor of moderating a panel at MIT1 on the Intelligent Integrated Store. 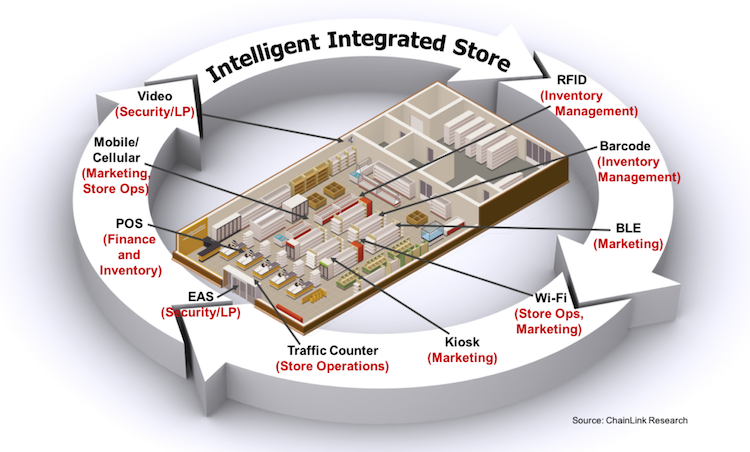 The integrated store concept has been around for at least five years, but has been given added impetus by recent developments in continuous overhead RFID/RTLS locating capabilities using passive tags, video analytics, BLE,2 and the integration of these and other store sensing technologies. RFID tags are now being included on billions of items, with more and more retailers deciding to tag all apparel items (and some retailers tagging all general merchandise items3 as well). Historically, each major retail store function has been managed in silos—security and loss prevention, labor/workforce management, inventory, promotions, and merchandising—each with its own separate systems, strategies, and personnel. Video surveillance and EAS systems have been traditionally used solely for loss prevention; RFID and barcode for inventory management; POS data for finance and inventory, and so forth. The vision of the intelligent integrated store is to break down those barriers so that the systems and functions work together to create a higher order intelligence and detailed granular awareness about what is happening in the store. For example, imagine if real-time RFID data could be married with real-time video analytics to identify individual shoppers4 as they move through the store, precisely identify which items the shopper picked up off the shelf, what they placed in their cart, what items they left in the dress rooming, the sequence of their actions, and so forth. This is so much more information and insight than is yielded today from the daily POS data upload. Retailers value these highly granular insights into the movements, actions, and intentions of shoppers in their stores. They want store associates to be alerted when a shopper needs attention or an item needs to be restocked or brought back from an incorrect location. Merchants and store planners want to know how shoppers are shopping, which items are being tried on but put back on the shelf, the sequence of looking at items, and the physical paths taken through the store. Marketers would love to present shoppers with a personalized context-relevant digital-physical experience as they move through the store. Connected Fitting Room—The shopper can use a magic mirror or large kiosk interface within the fitting room to view detailed information about the products they brought into the fitting room, see if other colors and sizes or like items are available, see matching accessories, request that those accessories or a different size or color be delivered to the fitting room, and ideally complete the total sales transaction right there if desired. The individual pieces of technology to accomplish this are relatively mature, but there has been limited deployment so far … primarily proof-of-concepts, but growing. Endless Aisles—A kiosk or display in the store that lets the customer order items from a much larger selection than is in the store. We are starting to see broader use of these. Digital Pricing Signage—Low-power wirelessly connected e-ink based pricing displays can replace paper pricing labels, enabling dynamic real-time pricing and product information. The technology is mature, deployments are few, but some of those are extensive. Expanding on this, by leveraging RFID, the signage can be updated by awareness of product in the vicinity. Smart Sensing—Using overhead RFID phased array readers (potentially combined with other technologies) to monitor in real-time the location of inventory throughout the store for everything from inventory visibility, omni-channel, and BOPIS5 to loss prevention and positioned well to connect the silos. This technology is still emerging (for more on this, see Road to Value for RFID in Retail: Part Four—The Path to Continuous Real-time Visibility). Next, we heard from Jonathan Aitken, Director of IT at lululemon athletica, who spoke first about how lululemon has embraced RFID (tagging 100% of all items) leading to 98% inventory accuracy and an 8% sales uplift. Once the ROI had been proven out in a 2014 pilot, lululemon implemented RFID across all North America and Hong Kong stores6 within six months last year (with the help of Tyco Retail Solutions). They have integrated RFID readers at checkout with their Point-of-Sale system, so that they know exactly which items have been purchased. You can watch a short (2½ min.) video of how lululemon is using RFID here. They are using RFID and other omni-channel capabilities to create an endless aisles application, which they call the ‘back back room.’ lululemon is doing ship from store and soon will implement BOPIS and the ability to see store inventory online. They are investigating ‘heatmap’ tracking of customers, using cameras and Wi-Fi, as well as the use of overhead RFID/RTLS systems to track product movement, fitting room use, conversion, and loss prevention. Beth Rick, Director of Customer Portfolio Transformation at DSW then talked about their ‘transformation journey.’ DSW has been going through a complete reassessment and reinvention of the retail chain, and Beth is part of the team leading those transformation efforts. Much of the talk was about the human side of these kinds of sweeping changes. Certainly for the integrated store, there are big changes in getting previously siloed functions to work together as well as changing the kinds of tools and workflows that store associates use. Beth also talked about the importance of defining and measuring success; holding people accountable. The last speaker was Vibhu Norby, Co-Founder and CEO of b8ta. As of this session, they had a single store, located in Palo Alto, but plan to open five more stores by the end of this year. b8ta is based on a pretty radical new approach to the business model of the store and its primary function—not as a warehouse for stuff to buy, but as a showroom to see and touch, try out, and learn about products and services. 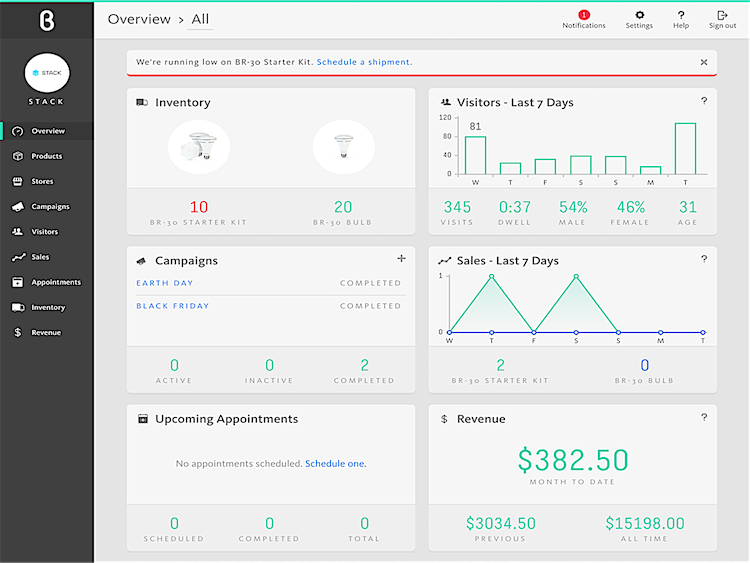 b8ta provides a showroom and demo service to manufacturers and is paid based on how many people walk by, stop at, engage with, and receive a demo of the products that the manufacturer has in the b8ta store. Manufacturers thereby have a strong interest in training b8ta’s store associates and instilling passion and expertise about the products. b8ta’s stores are outfitted with numerous cameras and other sensors to accurately measure and record in real-time the shoppers’ engagements with each and every product throughout the store. The manufacturer can see in near real-time exactly what is going on (see Figure 3). With this model, the store is no longer dependent on closing the transaction in order to get paid for the service they are providing. This could be the way of the future for many types of stores to survive the accelerating growth and market share of e-commerce online sales. This was a sold-out session and we filled the auditorium at MIT. We ended with ~45 minutes of highly interactive Q&A about everything from the hardware being used to the new business models. We ran out of time, otherwise could have gone on for probably another hour of questions. This is obviously a topic of intense interest. The intelligent integrated store—the integration of the siloed systems and functions—is still in the early vision phases. But retailers are trying many different things and many have a roadmap and vision to get there.